The current study has compared the fluctuations of atmospheric precipitable water over Iran during three periods of 1948 – 1957, 1958 – 1978, and 1979 – 2012 using upper-air reanalyzed data from NCEP/NCAR. The results indicated that, in all the three periods, average distribution and coefficient of spatial variation decreased with altitude. In contrast, there was a positive relationship between coefficient of spatial variation and altitude. 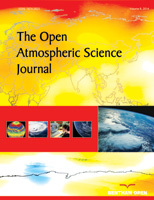 The results of trend analysis showed that atmospheric precipitable water of Iran calculated using the upper-air reanalyzed data by NCEP/NCAR experienced various fluctuations during the three periods of 1948 – 1957, 1958 – 1978, and 1979 – 2012. The increase of the precipitable water during the first period was not significant at the level of 95%. The increase of the precipitable water during the second period was significant at the level of 95% just in 25% of the regions. In contrast to the second period, 70% of the country’s area followed a declining trend. However, this decreasing trend was not significant at the level of 95%, either. The results of Alexandersson statistical method showed that the biggest shift in the average of precipitable water happened during the third period. Overall, variations in the precipitable water over Iran in the past ~60 years are not within the uncertainty of the reanalysis data and are therefore clearly discernible. Keywords: Precipitable water, NCEP/NCAR, Periodic fluctuations, Average axis, Alexandersson statistical method, Iran. © 2018 Rousta et al.